America’s National Park Service (NPS) is full of mountains, valleys, spectacular views, and natural beauty. It’s no wonder that those features make National Parks so popular among RVers. Most National Parks often offer accommodations for RVers, but with a catch, many of these RV grounds don’t provide utility hookups for your ride. This means you’ll be dry camping and for some travelers, this isn’t what they signed up for. Why Don’t Many National Parks Offer Hookups? The answer is rather simple: National Parks are precious, protected land set aside for a reason. They are meant to be untouched by people so that visitors will enjoy their natural wonder. If every National Park had full utility hookups, you are looking at pipes and wires being laid, possibly for miles, tearing up the protected land and ruining much of the natural beauty. Though it may seem frustrating at first, you must look at the lack of hookups as a good trade-off. By forcing RVers to dry camp, the National Park Service is preserving the natural beauty for this and all future generations. There are only a few National Parks in the US that offer hookups. While you may want the luxury of hookups on your adventures, the NPS is chock full of beauty and wonder. Stay at the below parks, but don’t let the thought of going without hookups keep you from seeing even more of America’s natural wilderness. While Yellowstone National Park offers 12 unique campgrounds in the park, Fishing Bridge Campground is the only site that has utility hookups for the RV. Fishing Bridge provides 340 sites with 50 Amp electrical, water and sewer hookups. The grounds also contain a general store, shower and laundry facilities, and a dump station. The park is located near the mouth of the Yellowstone River, close to Yellowstone Lake. Portions of Grand Teton National Park grounds are operated by Vail Resorts and are a bit more hospitable to RVs. Parks with utility hookups include Colter Bay RV Park with 112 RV-friendly sites complete with water, sewer and electric. Colter Bay is close to Jackson Lake. Another option is found in Headwaters Campground with 20- and 50-amp electrical options, water, and sewer. Headwaters is located five miles north of Grand Teton park boundaries. Trailer Village is another RV site that is operated by a concessioner and not the park service itself. Trailer Village is the only RV friendly park within the boundaries of Grand Canyon National Park. It is located next to Mather Campground on the South Rim of the canyon. Trailer Village offers both 30- and 50-amp electric hookups, water, sewage, cable and can accommodate RVs up to 50 feet in length. Reservations fill up fast so make sure to book well in advance. What Do You Do If You Need Hookups? Most people will find that staying right outside of National Park boundaries will provide many of the same benefits of camping within the park itself with the added benefit of getting your creature comforts. Many of the popular National Parks have full-service RV grounds within a stone’s throw of the park boundaries. These are popular alternatives to staying in the park itself for many RVers looking for optimal comfort levels when in and around their RV. Pro Tip: Dry camping, boondocking, and other types of RVing are meant to take you out of your comfort zone. Once you understand this, you’ll be more comfortable with giving them a shot on your next adventure. If you want to experience America’s National Parks, it’s best to camp directly in them. Learn some valuable dry camping skills, and you’ll be able to stay within the boundaries of most parks. 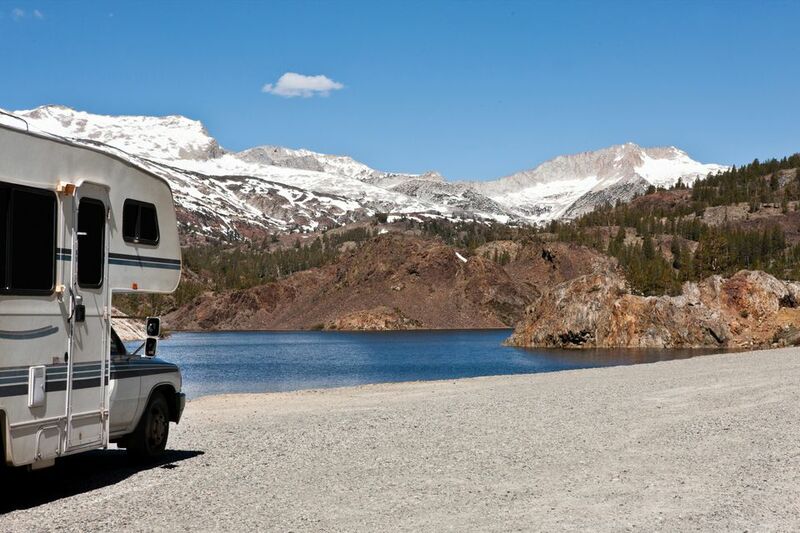 Dry camping doesn’t have to be difficult for RVers. By planning, you can get the most out of any trip whether you have access to hookups, dump stations, and other luxuries you’re used to taking advantage of on the road. You’ll also have peace of mind knowing you’re keeping the land intact by not using any hookups at our nation’s National Parks.